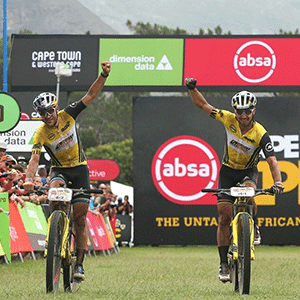 Cape Town - The Swiss pairing of Nino Schurter and Lars Forster (Scott-SRAM MTB-Racing) once again left no doubt that they have the strongest legs at the Cape Epic when they picked up their third win in three days on Tuesday. Schurter and Forster launched a brutal attack up a steep climb 10km from the finish on Stage 2 and then powered away to a 30-second lead over the KROSS-SPUR team of Sergio Guiterrez and Ondrej Cink with Manuel Fumic and Henrique Avancini (Cannondale Factory Racing) a second further back. In the Women’s category Annika Langvad and Anna van der Breggen (Investec-songo-Specialized) won the stage and extended their lead by another two minutes, despite their plans to use the day as a recovery ride. They are now just under eight minutes clear of Ariane Lüthi and Maja Wloszczowska (Kross-Spur Racing) with Candice Lill and Adelheid Morath (Summit Fin) a distant 18 minutes behind the leaders. Theresa Ralph and Sarah Hill (Galileo Risk) won the stage in the African Women’s Special Jersey race but overall are still 38 minutes behind Sam Sanders and Amy Mcdougall (dormakaba Ladies). In the equivalent African Men’s Special Jersey race, Alan Hatherly and Matt Beers (SpecializedFoundationNAD) finished seventh overall for the day and now lie sixth overall on GC, leading the race for red by 17 minutes over Imbuko Giant’s Marco Joubert and Nicol Carstens. Tomorrow’s Stage 3 is a 107km out-and-back loop from Oak Valley and takes in the famed Groenlandberg climb and its treacherous descent.